Naveen Mathur keenly tracks economic data from the United States, from growth and inflation numbers to the central bank's rate-setting meetings. Why? These indicators give him clues to the possible direction the price of gold could follow in India, says the associate director for commodities and currencies at Angel Broking. And the latest data isn't very encouraging for the yellow metal. Bullion prices are likely to remain weak as an economic recovery in the US will give more room to the Federal Reserve, the country's central bank, to reduce its monthly bond purchases and raise interest rates sooner than anticipated, prompting investors to shift their money from gold to equities in search of higher returns, he says. For years, investors worldwide have pumped money into gold as the yellow metal was considered a safe investment. But that view was shattered in 2013 when gold prices slumped 28 per cent in dollar terms. This was the first annual loss in 12 years and the steepest drop in three decades. The fading appeal of gold as a safe-haven investment is evident also from the changes in demand. Investment in gold jewellery, bars and coins rose in 2013 but exchange-traded funds focused on bullion experienced massive outflows. ETF investors sold about 900 tonnes of gold. Overall, demand for gold fell 15 per cent in 2013 from the previous year. (See Weak Appetite). Gold prices in India, however, fell only five per cent in 2013 as the rupee depreciated nearly 20 per cent against the US dollar. As India buys almost all its gold from overseas, the rupee's decline offsets the price drop in overseas markets by making imports costlier. Also, the government's successive increases in gold import duty to curb demand as part of efforts to narrow the current-account deficit created a premium on bullion prices. Abhishek Chinchalkar, precious-metals analyst at Anand Rathi Commodities, says this premium is around $70 to $90 (about Rs 4,200-5,400) to the spot international price and this will drop only if the restrictions on gold imports are eased. Investors have also been mystified by the divergence in returns generated by gold ETFs in India compared with the market price. Gold ETFs showed returns of a negative 14 per cent in 2013. Manish Banthia, Fund Manager, ICICI Prudential Gold ETF, explains the anomaly. He says that, while the rupee price of physical gold takes into account the premium, the valuation of the ETFs doesn't consider physical market premiums because it is based on an old formula that considers the imported cost converted into rupees plus insurance and taxes. "Investors should not be perturbed by this since the physical gold derived by selling the ETF can be sold at market price," he says. "The divergence is only notional." So, where is gold headed? And what should investors do? Financial planners typically recommend investing 10 per cent of the portfolio in gold, depending on the investment objective and risk appetite. According to Angel's Mathur, long-term investors should add gold as part of their portfolios on every price drop because bullion's appeal will never wane irrespective of global macro-economic developments. He says one should invest regularly via a systematic investment plan to get an average price. This could be done via an ETF or through gold coins and bars as a physical investment. Chinchalkar says gold prices in rupee terms would depend on the foreign-exchange rate in coming months. "If the rupee weakens against the dollar and slides back towards 64 or 65, the downslide [in gold prices in rupee terms] is likely to be contained," he says. He suggests investors should consider selling the yellow metal if prices range between Rs 30,000 and Rs 32,000 per 10 grams. Mathur says investors looking to make a lump sum investment should wait until prices drop to Rs 25,000 per 10 grams as the downside risk is limited from there on. 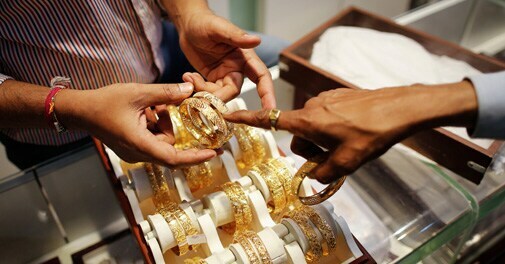 He expects gold prices to trade in a range of Rs 24,000 to Rs 34,000 per 10 grams over the next one year. "The general sentiment is negative for gold. The outcome of elections will decide the trajectory of gold imports into the country and, in turn, the price," says Mathur. "If the tough stance continues, the likelihood of gold prices underperforming is very high."